Deon Cole is one of the most in-demand talents on the comedy scene. Not only is he currently a cast member on four hit TV shows, he has also appeared in several popular feature films, released multiple standup specials, and follows a non-stop tour schedule. Armed with a “comic authority born of undeniable charisma” (AV Club), Deon’s completely unique style and delivery have made him a wildly popular performer with fans and critics alike. Deon plays the character of adjunct college professor "Charlie" on ABC's hit series Black-ish. His role on the Emmy-nominated and Golden Globe Award winning show, now in its fourth season, is a favorite, with Vulture declaring “Deon Cole is a comedic genius,” AV Club naming him a “scene stealer,” and Variety offering “Cole reminds me of John Belushi, another performer who brought essential sweetness to his unpredictable characters, and who could make you laugh just by looking a certain way at another person on screen.” In January 2018 Deon brought the beloved “Charlie” to Freeform in the Black-ish spinoff series Grown-ish, with Variety declaring him “the hilarious secret weapon that “Black-ish” has deployed in many side-splitting workplace scenes.” The half-hour comedy, which Deon stars in alongside Black-ish breakout Yara Shahidi, is a contemporary take on the current issues facing both students and administrators in the world of higher education. Deon also stars as “Det. Daniel "DJ" Tanner” on the TBS comedy Angie Tribeca. The popular show, created by Steve and Nancy Carell, also stars Rashida Jones and is currently in its fourth season. In addition to his three scripted shows, Deon host the game show Face Value currently airing on BET. The show, Executive Produced by Wanda Sykes, finally answers the age-old question, “Can you judge a book by its cover?” Face Value flips the script to award cash and prizes to contestants for correctly guessing facts about strangers from all walks of life –based solely on their appearance and a few personal details. As host, Deon humorously breaks down stereotypes, exposes prejudices, and celebrates the human spirit by highlighting the commonalities and differences among people of various backgrounds, races, religions, beliefs and life experiences. In addition to Deon’s cast member status on four TV shows, Deon will appear in the Whitney Cummings directed film The Female Brian. Fellow cast members of the much-anticipated feature include Toby Kebbell, Beanie Feldstein, Cecily Strong, Sofia Vergara, Blake Griffin, Lucy Punch, and James Marsden. He has also been featured on several other comedy fan-favorite series including Benched (USA), The League (FX), and Wild N’ Out with Nick Cannon (MTV). He hosted his own series Deon Cole’s Black Box on TBS in 2013, and he is a familiar face on the late night and daytime circuits, with multiple appearances on Conan (TBS), @midnight (Comedy Central), Last Call with Carson Daly (NBC), The Talk (CBS), and The Real (BET). Deon earned his first Writers Guild Award Nomination and his first Emmy Nomination for “Writing for A Variety, Music or Comedy Program” in 2010 as part of the writing staff on The Tonight Show with Conan O'Brien (NBC). He earned his second Emmy Nomination in 2011 for his work with the writers of CONAN (TBS) and he wrote for Conan O’Brien when he hosted the 2013 White House Correspondents Dinner. Most recently, Deon received a 2017 NAACP Image Award Nomination for “Outstanding Supporting Actor in a Comedy Series” for his work on Black-ish and was featured as a presenter at the 2017 BET Awards. In June 2016, Deon’s first hour standup special Cole Blooded Seminar premiered on Comedy Central. His half hour special premiered on Netflix’s The Standups on July 4th, 2017. 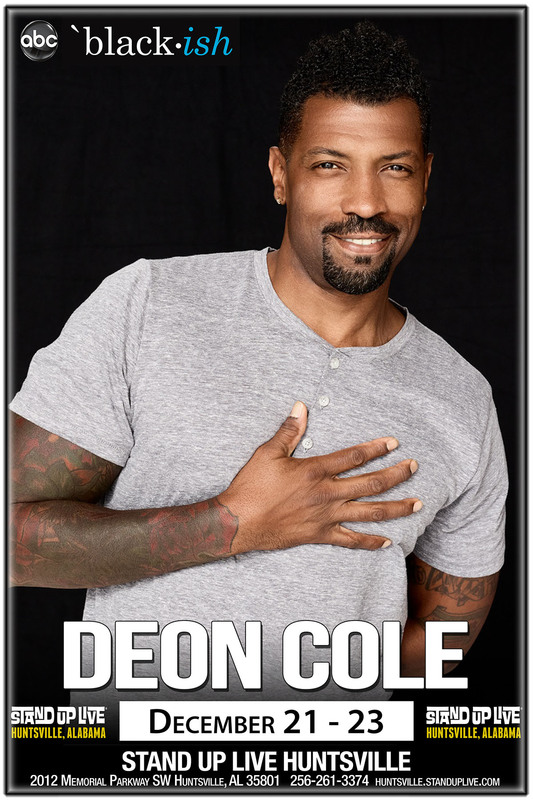 His standup comedy has also been featured on Shaq's All Star Comedy Jam (Showtime), John Oliver’s New York Stand-Up Show (Comedy Central), and Laffapalooza (Comedy Central), along with his own Comedy Central Presents: Deon Cole. On the big screen, Deon was seen in all three movies in the wildly popular Barbershop feature film franchise, and he will appear alongside Sofía Vergara, Alysia Reiner, and Chris D'Elia in the feature The Female Brian directed by Whitney Cummings. Deon performs standup to sold out audiences at venues across the country. He is originally from the south side of Chicago and currently lives in Los Angeles.